Fire and Ice is the second book in the fantasy Warriors series. It follows the opener of the series, Into the Wild (see ITB’s review of Into the Wild here) with the stories of Firepaw and Grayopaw, now newly promoted to full warriors of ThunderClan. We continue the story with the same cast as the first book, and immerse ourselves further in the forest and stories of the Clan. Fireheart and his friend, Graystripe, are newly promoted warriors in the ThunderClan. Their first task is to find and retrieve WindClan, a clan which was driven from its home by the murderous Brokenstar, which they helped to depose in book 1. Soon after, Bluestar, leader of the ThunderClan, gives Graystripe and Fireheart theirown apprentices to train in the warrior tradition. But things soon spiral out of control when, on a hunting trip, Graystripe falls through thin ice and nearly drowns, until he is rescued by a RiverClan cat. This begins a relationship which begins to lure Graystripe away from ThunderClan. As Graystripe spends less and less time at camp, Fireheart realizes that he is the only one who can expose Tigerclaw, the ThunderClan deputy, and bring him to justice. But Tigerclaw is out to get him; and control of the clan! 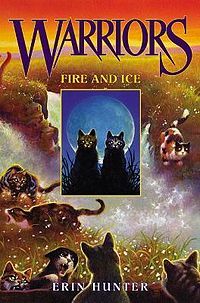 Fire and Ice follows the first book in the Warrior series by being easy to read, continuing an interesting story, and captivating you as you read the fate of ThunderClan. The book is quite easy and simple to follow, though captivating in its plot. I recommend this book for elementary to middle-school readers, or anyone interested in fantasy (As I wrote in my earlier review, I’m a high school senior and I still enjoy following Fireheart and his life). I remember those books when I was a little kid, it sure does bring back happy memories. @Corey: I’d say these are on a slightly easier reading scale than Redwall. I started reading Redwall in fifth grade, but I think fourth or even third graders would be able to understand the Warriors books.